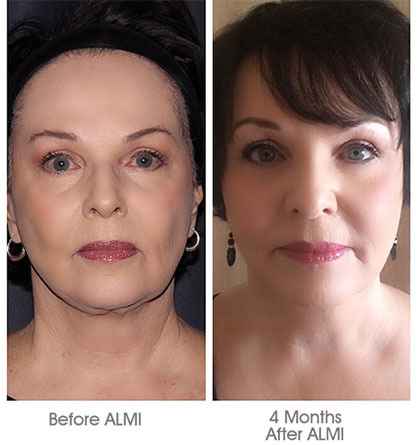 As of 2017, ALMI is a new, brand-named facial volumizing procedure. It involves grafting a small amount of fat from another part of the body, mechanically processing it into its smallest form and, through tiny injections, using it to fill out facial wrinkles and areas of the face that need additional volume. Because it utilizes a patient's own fat, it has bio hormonal benefits that improve the health of the skin. Also, the ALMI process of mechanically breaking down the natural fat into its smallest-particle form allows opportunities for a long-lasting, smooth finish. ALMI stands for Autologous Lipocyte Micronized Injection. This is a minimally invasive procedure that can be done in the office, taking as little as 45 minutes. Dr. Moosavi numbs the small area where the fat is to be removed with a small needle stick, removes fat and mechanically processes it, introducing no new chemicals into the tissue. The processed, natural fat is injected into different areas of the face, including superficial areas close to the surface of the skin, using small-gauged cannulas. This is done to create a smoother finish with the bio hormonal benefits that come from using a person's natural tissue. 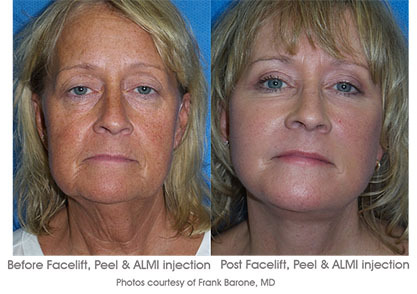 Dr. Moosavi has been trained to do the ALMI procedure by itself or combined with other fillers to enhance deeper facial tissue as well. Results should visible immediately and are expected to last for more than two years. Is ALMI covered by insurance? ALMI is a cosmetic procedure and is not covered by insurance companies. What I first noticed is the health of my hair. A little over week after my procedure, my hair looked shinier & healthier. I have fine hair, so I don’t use products because it weighs it down. But now it looks like I use a leave-in conditioner! Also, the hair at the roots are standing up (stronger), and I noticed little baby hairs coming out at the front. The procedure itself was so easy. When Dr. Tess went in to remove the fat, I thought she was just massaging my stomach! The injections to my scalp were also quick and just felt like a tiny pinch. Overall, the procedure was very easy. I’m so excited to see what happens in the next few months. I think ALMI might be the best thing since sliced bread. Over the past 9 years I have had more syringes of filler injected in my face than I can count trying to replace volume loss. 4 hours post ALMI, I look fantastic. No crazy swelling. I will not have to hide or tell a story why I look disfigured for days after. This may be my hands down favorite thing I have ever done for volume loss. Overall discomfort 2 or 3 on a scale 1-10. JP can not believe the difference on how good it looks right after treatment.